This post explains MySQL performance for Linkbench on a fast server. This used a low-concurrency workload to measure response time, IO and CPU efficiency. Tests were run for MyRocks, InnoDB and TokuDB. I wrote a similar report a few months ago. The difference here is that I used an updated compiler toolchain, a more recent version of MyRocks and MySQL 8.0.3. The results didn't change much from the previous blog post. There is a CPU regression from MySQL 5.6 to 5.7 to 8.x. About 30% of throughput is lost on load and transaction rates from 5.6.35 to 8.0.3. I assume most of this is code above the storage engine layer. InnoDB writes more than 10X to storage per transaction compared to MyRocks. An SSD will last longer with MyRocks. I used my Linkbench repo and helper scripts to run linkbench with maxid1=10M, loaders=1 and requestors=1 so there will be 2 concurrent connections doing the load and 1 connection running transactions after the load finishes. My linkbench repo has a recent commit that changes the Linkbench workload and this test included that commit. The test pattern is 1) load and 2) transactions. The transactions were run in 12 1-hour loops and I share results from the last hour. The test server has 48 HW threads, fast SSD and 256gb of RAM. Tests were run for MyRocks, InnoDB from upstream MySQL, InnoDB from FB MySQL and TokuDB. The binlog was enabled but sync on commit was disabled for the binlog and database log. All engines used jemalloc. Mostly accurate my.cnf files are here but the database cache was made large enough to cache the ~10gb database. InnoDB from FB MySQL 5.6.35 was compiled on June 16 with git hash 52e058. The results for it aren't interesting here but will be interesting for IO-bound linkbench. The performance schema was enabled for upstream InnoDB and TokuDB. It was disabled at compile time for MyRocks and InnoDB from FB MySQL because FB MySQL still has user & table statistics for monitoring. The first two graphs show the load and transaction rates relative to InnoDB from upstream MySQL 5.6.35. For this test it has the best rates for load and transactions. There is a big drop in throughput for InnoDB from 5.6.35 to 8.0.3 for both the load and transaction tests. 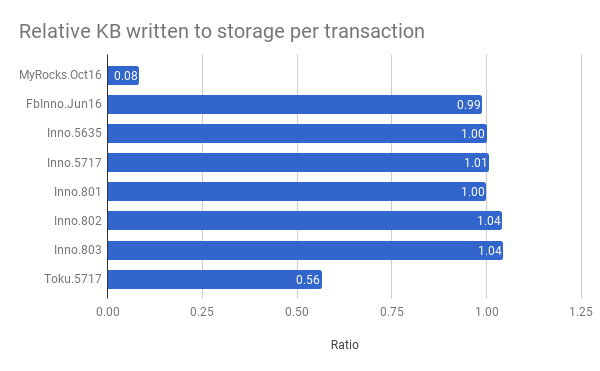 The chart below has the KB written to storage per transaction. The rate for InnoDB is more than 10X the rate for MyRocks. An SSD will last longer with MyRocks. The rate for MyRocks is also much better than TokuDB. The rate here for TokuDB is worse than what I measured in September and I have yet to debug it. All engines use a similar amount of space after the load, ~15gb. But MyRocks does much better after 12 hours of transactions -- InnoDB is ~1.6X larger and TokuDB is ~1.19X larger. The problem for InnoDB is B-Tree fragmentation. The advantage for MyRocks is leveled compaction which limits garbage to ~10% of the database size. 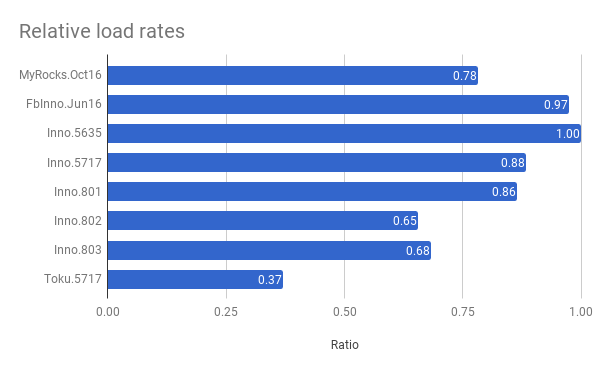 InnoDB 5.6 has the best insert rate but there is a regression from 5.6.35 to 5.7.17 to 8.0.3. I assume most of that is from code above the storage engine. These are results from the 12th 1-hour loop of the transaction phase. All of the data is here. I adjusted iostat metrics to for MyRocks because iostat currently counts bytes trimmed as bytes written which is an issue for RocksDB but my adjustment is not exact. 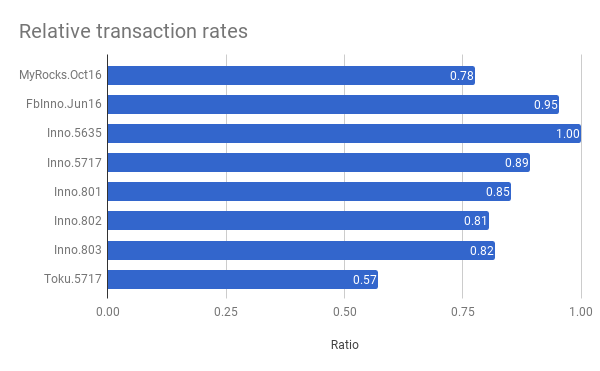 InnoDB 5.6 has the best transaction rate but there is a regression from 5.6.35 to 5.7.17 to 8.0.3. I assume most of that is from code above the storage engine. Write efficiency (wkb/t) was better for MyRocks. InnoDB writes more than 10X to storage per transaction compared to MyRocks. Space efficiency is better for MyRocks. 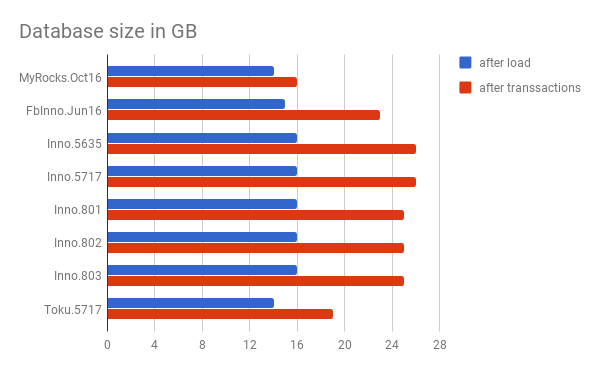 InnoDB is ~1.6X larger. In this post I compare MyRocks and InnoDB using IO-bound sysbench and a small server. The goal is to understand where MyRocks differs from InnoDB. I previously published more results for many versions of MyRocks and InnoDB. Here I use MyRocks from June 2017 and InnoDB from upstream 5.6.35 and 5.7.17. Two things look better in MySQL 5.7 -- InnoDB range scans and optimization of queries with large in-lists. For many of the workloads InnoDB writes between 5X and 20X more to storage per transaction. An SSD will last longer with MyRocks. Full-scan perf from MyRocks without compression matches InnoDB-5.7 and is much better than InnoDB-5.6 when filesystem readahead is enabled. Now we need to make that feature work for real. 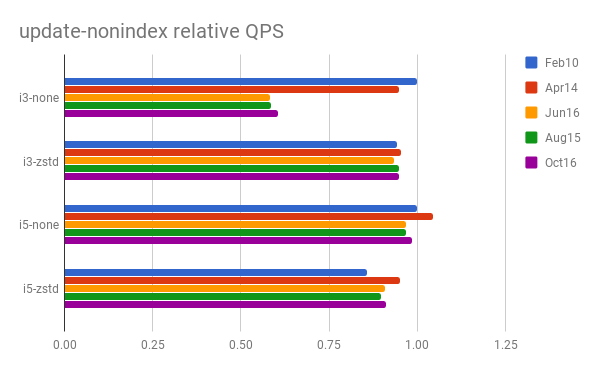 MyRocks QPS was >= than InnoDB on most of the write-heavy tests. Read-free index maintenance makes a big difference for MyRocks on some of them. InnoDB QPS was > MyRocks on the point-query tests. The 5.7 optimizer might help here. The tests used MyRocks from FB MySQL which is currently based on MySQL 5.6.35. The build is from June 16 with git hash 52e058 for FB MySQL and 7e5fac for RocksDB. Upstream 5.6.35 and 5.7.17 was used for InnoDB. All tests used jemalloc with mysqld. My use of sysbench is described here. The my.cnf files are here for the i3 NUC and i5 NUC. I tried to tune my.cnf for all engines. For all tests the binlog was enabled but fsync was disabled for the binlog and database redo log. Sysbench is run with 2 tables, 80M rows/table on the i3 NUC and 160M rows/table on the i5 NUC. Each test is repeated for 1 and 2 clients. Each test runs for 600 seconds except for the insert-only test which runs for 300 seconds. The database is much larger than RAM. I repeat tests on an i5 NUC and i3 NUC. The i5 NUC has more RAM, a faster SSD and faster CPU than the i3 NUC, but I disabled turbo boost on the i5 NUC many months ago to reduce variance in performance and with that the difference in CPU performance between these servers is smaller. The SSD on the i3 NUC is slower than on the i5 NUC. 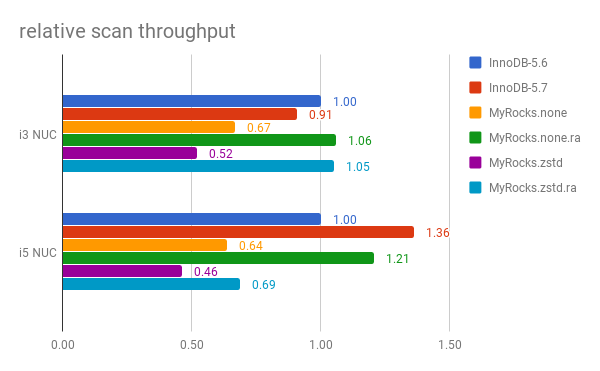 InnoDB is more dependent than MyRocks on IO performance and in some tests below MyRocks does much better on the i3 NUC than the i5 NUC relative to InnoDB. Tests are repeated for MyRocks without and with compression. The compression configuration is none for L0/L1/L2 and then with LZ4 for the middle levels of the LSM tree and then zstandard for the max level. In the rest of this post that is described as zstandard compression. All of the data for the tests is on github for the i3 NUC and the i5 NUC. Results for each test are listed separately below. The graphs have the relative QPS where that is the QPS for a configuration relative to the base case. The base case is InnoDB from upstream 5.6.35. 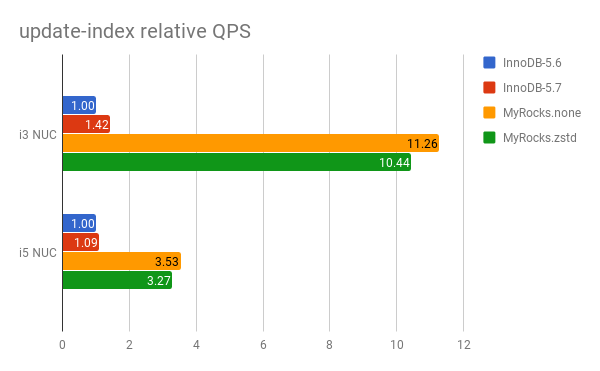 The base case is faster when the relative QPS is less than 1. The tables that follow have the absolute and relative QPS. The graphs have the QPS relative to the InnoDB from MySQL 5.6.35. The name MyRocks.none is for MyRocks without compression and MyRocks.zstd is for MyRocks with zstandard compression. There are 4 types of tests and graphs for each type: write-heavy, scan-heavy, point-query, inlist-query. The results within each group are not as similar as for the in-memory tests, so there are more graphs here. The tests are explained here. The write-heavy group includes update-inlist, update-one, update-index, update-nonindex, delete and insert. The graphs are the relative QPS for update-index, update-nonindex and insert. MyRocks does 3X to 10X better than InnoDB on update-index because non-unique secondary index maintenance is read-free for it. The scan-heavy group includes a full scan of the PK index, read-write with range-size set to 100 and 10,000 and then read-only with range-size set to 100 and 10,000. 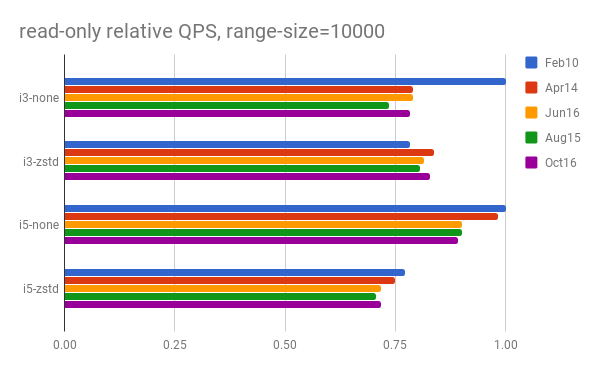 The graphs are the relative QPS for read-write with range-size=100, read-only with range-size=10,000 and then full-scan. The results for read-only and full-scan are for the test run after the write-heavy tests. The results for full-scan include two extra configurations that both enable filesystem readahead during the scan: MyRocks.none.ra, MyRocks.zstd.ra. The point-query group includes the point-query test run before and then after the write-heavy tests. The graph is the relative QPS for the test run after the write-heavy tests. The inlist-query group includes the hot-points test and the random-points tests. The random-points result is from the test run after the write-heavy tests. The graph is the relative QPS. 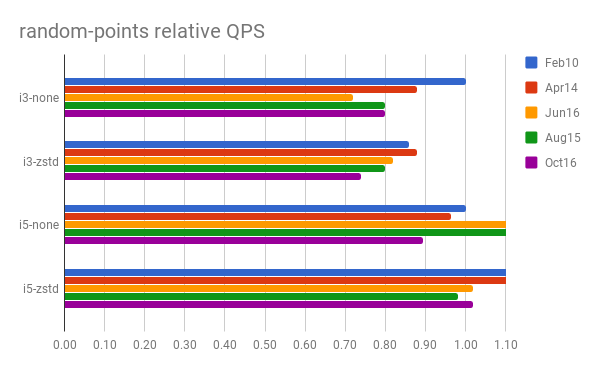 The sections that follow have the QPS and relative QPS. 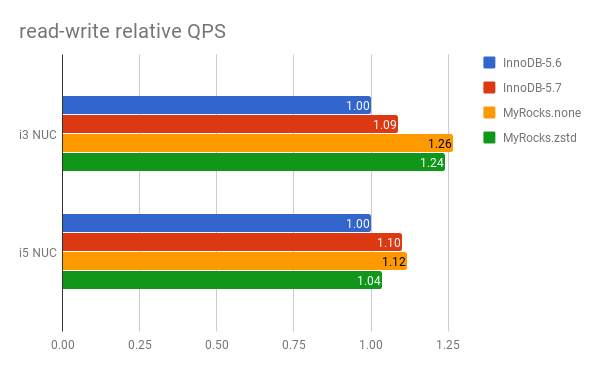 The relative QPS is the QPS for the test with 1 client relative to the QPS for InnoDB from MySQL 5.6.35 (InnoDB-5.6). Values are provided for the i3 and i5 NUC. For full-scan results are provided for two extra configurations that both enable filesystem readahead during the scan: MyRocks.none.ra, MyRocks.zstd.ra. As seen below readahead is great for full-scan. Unfortunately that feature is not ready for production. I don't know if filesystem readahead is the right solution in this case, but it was easy to use for a benchmark. For a range scan there is an iterator open on each level of the LSM tree and RocksDB does page at a time reads. For a long range scan those reads can be much larger than page at a time. Issue 723 is open for this. The full scan of the PK index is done before and after the write-heavy tests. Note that tests run before the write-heavy tests are still run immediately after the initial load. So in both cases there can be page write-back activity with InnoDB and compaction with MyRocks. But from data I haven't shared there were not writes in progress for the i5 NUC. CPU/query is 1.06X larger here for MyRocks.none compared to the previous test. Storage read operations per query are ~1.06 larger for InnoDB than MyRocks. CPU/query is ~1.5X larger for MyRocks than InnoDB-5.7. This is larger than above. CPU/query is ~4.8X larger for InnoDB-5.6 and ~3.4X larger for MyRocks than InnoDB-5.7. 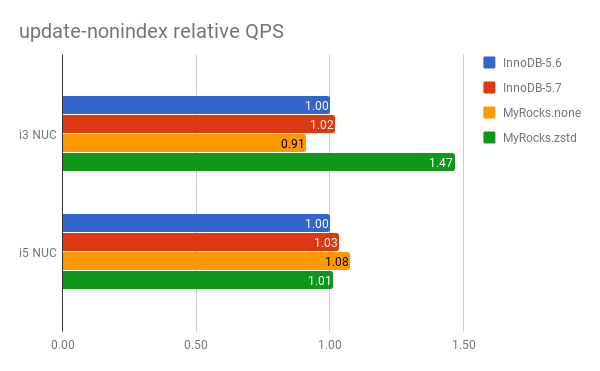 I wonder if a change in the optimizer explains this because this looks like a difference between MySQL 5.6 and 5.7 rather than between engines. CPU/query is ~3.5X larger for InnoDB-5.6 and ~2.6X larger for MyRocks than InnoDB-5.7. See the comment in the previous section. CPU/query is ~3X larger for MyRocks than InnoDB. I am wary of user reports that claim product X was lousy for them, then they moved to product Y and everything was awesome. Sometimes this means that product X was lousy -- in general or for their use case. Other times it means the team using product X did a lousy job deploying it. It is hard for the reader to figure this out. It can also be hard for some authors to figure this out thanks to the Dunning-Kruger effect so lousy reports will continue to be published. These reports are not my favorite form of marketing and some of the bad ones linger for years. We deserve better especially in the open-source database market where remarkable progress is being made. I have written before on benchmarketing. Other posts that mention it are here. In this post I compare four MyRocks releases from February to October using IO-bound sysbench and a small server. The goal is to understand where we have made MyRocks faster and slower this year. I previously shared results for in-memory sysbench with MyRocks and IO-bound sysbench with InnoDB. Tests were done for builds of MyRocks from February 10, April 14, June 16, August 15 and October 16. 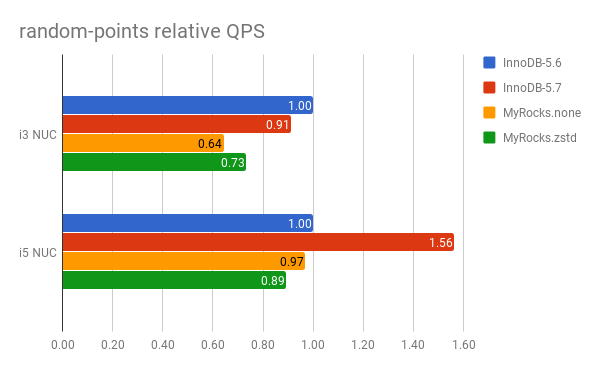 There is more variance in QPS on IO-bound sysbench than on in-memory sysbench. I didn't try to determine how much of that is caused by storage devices and how much by MyRocks. 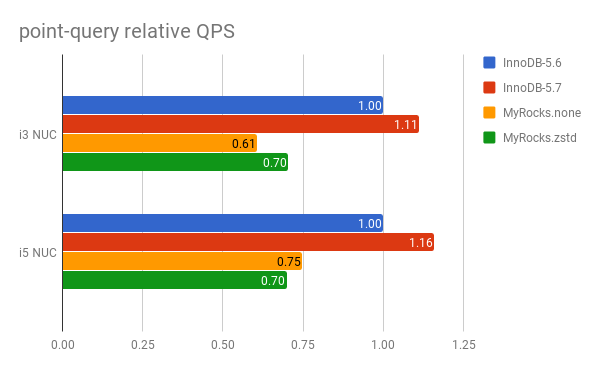 Some read-heavy tests run after write-heavy tests lose more QPS in October 16 than February 10 when compared to the same test run before write-heavy tests. This was also seen on in-memory sysbench. All tests used jemalloc with mysqld. The i3 and i5 NUC servers are described here. My use of sysbench is described here. The my.cnf files are here for the i3 NUC and i5 NUC. I tried to tune my.cnf for all engines but there are a few new & changed options in that time. For all tests the binlog was enabled but fsync was disabled for the binlog and database redo log. Compression was not used. I repeat tests on an i5 NUC and i3 NUC. The i5 NUC has more RAM, a faster SSD and faster CPU than the i3 NUC, but I disabled turbo boost on the i5 NUC many months ago to reduce variance in performance and with that the difference in CPU performance between these servers is smaller. Tests are repeated for MyRocks without compression and then with LZ4 for the middle levels of the LSM tree and zstandard for the max level. All of the data for the tests is on github for the i3 NUC and the i5 NUC. Results for each test are listed separately below. The graphs have the relative QPS where that is the QPS for a configuration relative to the base case. The base case is the QPS for the Feb10 build without compression. When the relative QPS is less than 1 then the base case is faster. The tables that follow have the absolute and relative QPS. The tests are explained here. 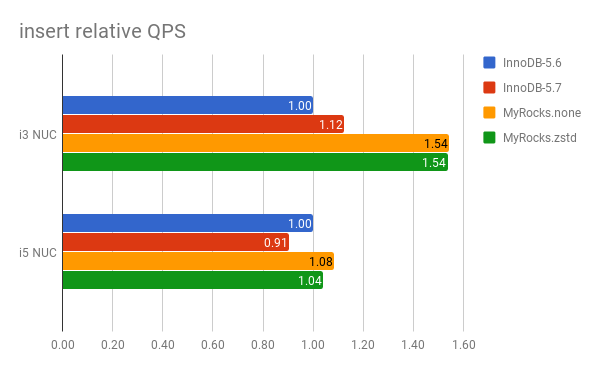 The graphs have the QPS relative to the Feb10 build without compression. i3-none and i5-none are results for the i3 and i5 NUCs without compression. i3-zstd and i5-zstd are results for the i3 and i5 NUCs with zstandard compression. There are 4 types of tests and I provided a graph for each type: write-heavy, scan-heavy, point-query, inlist-query. The results within each group are not as similar as for the in-memory tests, so I provide extra graphs here. The tests are explained here. The write-heavy group includes update-inlist, update-one, update-index, update-nonindex, delete and insert. The graphs are for update-nonindex and update-index. To keep this from getting out of hand I save the analysis for the per-test sections. 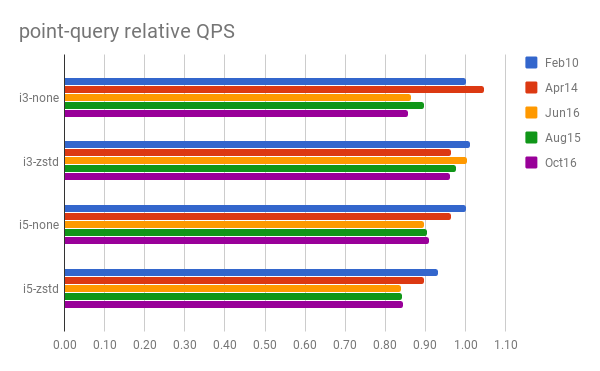 For write-heavy most of the results have a relative QPS of ~0.9 on the Oct16 builds that don't use compression. There is more variance on the i3 NUC as seen below for i3-none. The scan-heavy group includes a full scan of the PK index, read-write with range-size set to 100 and 10,000 and then read-only with range-size set to 100 and 10,000. The graphs are for read-write with range-size=100 and read-only with range-size=10,000. The largest regression comes after Feb10 or Apr14. From the graphs below the QPS decrease was larger on the i3 NUC. The point-query group includes the point-query test run before and then after the write-heavy tests. The graph is for the test run after the write-heavy tests. The largest regression comes after Apr14. 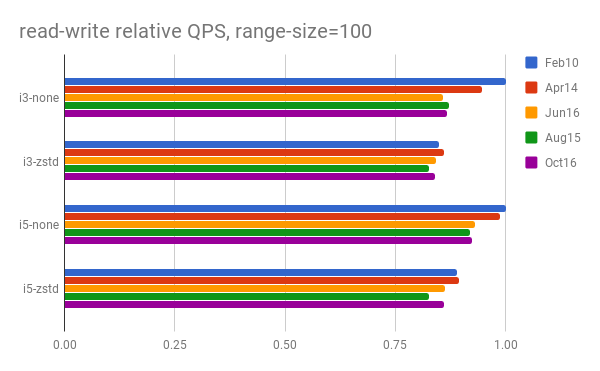 The Oct16 builds without compression have a relative QPS of ~0.9. The inlist-query group includes the hot-points test and the random-points tests run before and then after the write-heavy tests. The graph is for the test run after the write-heavy tests. Here and the sections that follow have the QPS and relative QPS. 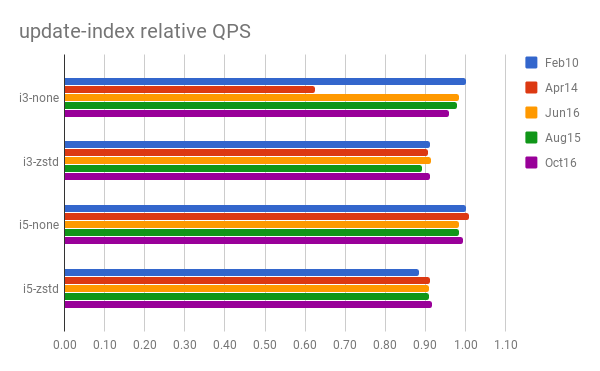 The relative QPS is the QPS for the test with 1 client relative to the QPS for feb10.none. Values are provided for the i3 and i5 NUC. The full scan of the PK index is done before and after the write-heavy tests. There is a regression on full scan throughput for the i5 NUC without compression. Otherwise there is a lot of variance. For the i5 NUC gets worse for both the before and after write-heavy tests. The reduction for the after write-heavy tests in oct16.none on both the i3 and i5 NUC might be worth debugging as it is ~15%. I repeated the Jun16 test with an option to make filesystem readahead more likely and that increased throughput by between 1.2X and 1.6X - see jun16.none.ra and jun16.zstd.ra. This option, rocksdb_advise_random_on_open=0, isn't safe to set for general purpose workloads. QPS in the Oct16 build relative to Feb10 is worse in all cases. QPS in the Oct16 build relative to Feb10 is slightly worse for oct16.none and the same or better for oct16.zstd. QPS in the Oct16 build relative to Feb10 is worse for oct16.none and better for oct16.zstd. QPS in the Oct16 build relative to Feb10 is worse for all cases except oct16.zstd on the i3 NUC. QPS in the Oct16 build relative to Feb10 is worse for all cases. The QPS here is less compared to the same test from the previous section. The tests in the previous section are run before write-heavy tests while tests here are run after them. It costs more to search the LSM structures after random updates. I have written more about mistakes to avoid when doing a benchmark with an LSM. The decrease in QPS from Feb10 to Oct16 is larger here than in the previous section. That is similar to the result on in-memory sysbench. The QPS here is less compared to the same test from the previous section, which is expected for read-heavy tests that follow write-heavy tests. But the decrease is huge for the i3 NUC. I didn't debug that. QPS in the Oct16 build relative to Feb10 is worse for all cases. 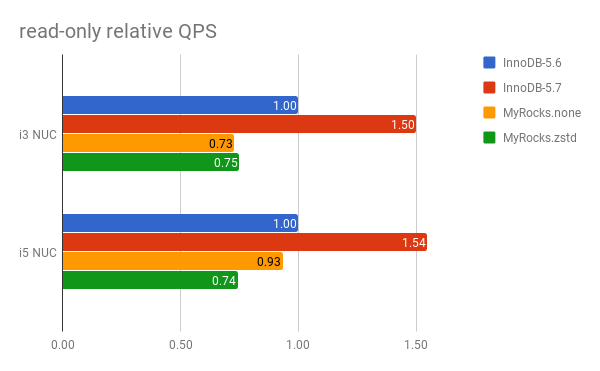 What I wrote in the point-query section is mostly true here, especially the part about QPS being worse for the test run after write-heavy tests. While this is an IO-bound benchmark the hot-points test is always in-memory. But the results here have more variance than on in-memory sysbench. I didn't debug that.